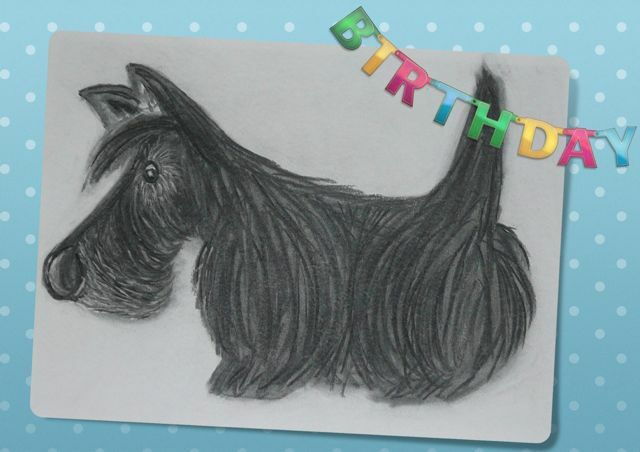 This is to wish our fur-end Bertie a Happy Birthday. He’s 2 years old today. His Mum and Dad are taking him to Bangor for the Races. But they’ve said that he cannot join in – boo-hoo! Oh Well, it’s for the best. Hi! Bertie here. What a great birthday I have had. Thank you for the card! You are great pals. I got a kennel for my birthday, I’m not quite sure what I’m supposed to do with it yet but I keep looking at it and having a bark. The races were great! we took a picnic and I had lots of fun. The horses were huge! I’m going to take to Mum and Dads bed now as I’m exhausted! It’s fab being two. Hope you all have a good weekend with big walkies! So glad you enjoyed your birthday! Those races sound great. Must get our peeps to take us one day. We went camping this weekend with too many two-legged folk and not enough doggies! But we enjoyed it all the same. Fantastic drawing….! Happy Birthday Bertie.